On September 8, 2016, sometime between 5:00 and 6:30 PM, a woman’s credit card was stolen from her wallet during an auto burglary while her car was parked at the YMCA, located at 1840 Meadowview Parkway in Kingsport. On the same evening, the stolen credit card was used to make three fraudulent transactions at Walgreens, located at 2790 East Stone Drive. The three transactions were made just minutes apart and totaled in excess of $1,500. 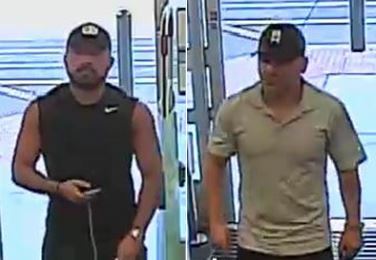 Two white male suspects in these incidents were captured on Walgreens surveillance video. Photos of these individuals are included in this release. Anyone who recognizes either of them is asked to contact Detectives in the K.P.D. Criminal Investigations Division at 423-229-9429 or call Kingsport Central Dispatch at 423-246-9111.